Regulatory reforms are encountering both progress and setbacks in Peru. Over the past half-century, more than 1,300 indigenous communities in the Peruvian Amazon have obtained title to more than 12 million hectares of land — about 17 percent of the country’s forest area. The gains have come through a series of regulatory reforms that have resulted in both progress and setbacks for indigenous communities, says Iliana Monterroso, a post-doctoral researcher at the Center for International Forestry Research (CIFOR) and one of the authors of a new study that forms part of the CGIAR Research Program on Forests, Trees and Agroforestry (FTA) on land and forest tenure reforms in Peru. “Understanding the history of the tenure reforms in Peru is important for identifying the challenges that remain and the opportunities that exist for addressing them,” Monterroso says. 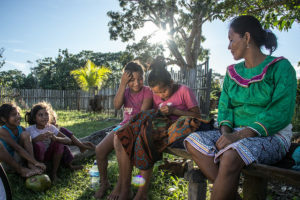 The struggle for tenure has led to the rise of local, national and pan-Amazonian indigenous organizations, which have played an increasingly active role in advocating for policies that respect their territorial rights. Fifty indigenous peoples inhabit the Peruvian Amazon, depending on the forests for their livelihoods. Despite regulatory reforms, however, it remains difficult for them to obtain legal rights to full use of those resources. Since the first modern laws governing indigenous peoples and land rights were passed more than a century ago, most legislation has promoted colonization, agriculture or private development in the Peruvian Amazon, with a mindset that views forests as possessing less economic value than farming or ranching. Even now, property rights are granted only for agricultural land, while the state retains ownership of sub-soil resources such as minerals, and of the forests above-ground — granting concessions or usufruct rights for use of those resources, but not relinquishing ownership. Government officials have often viewed indigenous peoples and their claims to territory as blocking progress by making it difficult to “put the forest to use,” says Monterroso. Indigenous communities, however, increasingly call for control over all resources- both on and under their lands. 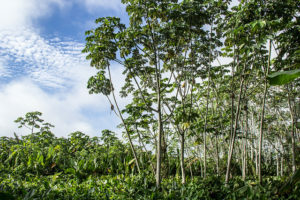 Meanwhile, programs linked to Peru’s commitments to reducing greenhouse gas emissions from deforestation and forest degradation (REDD+) offer support by including funds for titling indigenous lands. The first legal recognition of land rights for Peru’s Amazonian indigenous peoples was passed in 1974. A year later, the Forest and Wildlife Law placed forests under control of the government, which could grant the right to use them. This established the separate rules for forest and agricultural land that persist today. Under current regulations, soil analysis determines whether land is classified as suitable for forest or agriculture — regardless of whether it is already forested. Only the area classified as agricultural land can be titled. Rights in the area classified as forests are limited to the right to use, known as usufruct, for which communities sign a contract with the government. To commercialize forest products, a community must also apply for permits, or another type of official authorization. In many cases, they also must draw up and submit forest management plans. Because this multi-step process is complicated and expensive, only about 10 percent of titled communities have actually obtained usufruct contracts, Monterroso says. Because of the complexity and cost, some communities are limited to using forest resources only for subsistence use, or to extracting timber and other products illegally. Beginning in the 1980s, the Peruvian government passed a series of laws that promoted development, agriculture and colonization of forested land in the Amazon. Those efforts were stepped up in the 1990s, and continued into the 2000s. At the same time, the decentralization of government administration meant that more responsibilities were transferred from the national government to regional governments. Over the next decades, different agencies were in charge of land titling, and each change meant the physical transfer of hundreds of documents. Many were lost during the transitions, slowing the titling process for communities. Because the government had no single national registry of land titles and concessions for use of resources, its increasingly aggressive promotion of development projects resulted in overlapping concessions for timber, mining, oil and gas, tourism and reforestation. Many of those concessions also overlapped areas where indigenous communities were applying for titles, but they could not obtain land rights until certain overlapping claims were resolved. Tensions over land tenure came to a head with a series of 99 legislative decrees issued after Peru signed a free trade agreement with the United States in 2006. Government officials said the measures were needed to make Peruvian legislation comply with the trade pact, but several of the decrees weakened communal land rights and opened the way for extractive industries to operate on community lands. In 2009, indigenous organizations staged a two-month protest against the decrees, blocking a key Amazonian highway near the town of Bagua. In June 2009, security forces attempted to clear the roadblock, resulting in a violent clash in which 34 people were killed and more than 200 injured. The events at Bagua marked a turning point for indigenous rights. The most contentious decrees were repealed, and long negotiations led to enactment of Peru’s prior consultation law in 2011. The measure requires that indigenous people be consulted about any development project, or administrative measure, that could affect their collective rights. The first legislation submitted to consultation was the new Forest and Wildlife Law, which re-established the exclusive rights of indigenous communities to use forest resources in their territories. That right had been revoked by a natural resources law in 1997. By 2016, 1,365 Amazonian communities had obtained title to more than 12 million hectares of land, while 644 claims, totaling nearly 5.8 million hectares, were pending. As an alternative to individual community titles, indigenous organizations had also won the designation of 2.8 million hectares of reserves to protect semi-nomadic groups that shun contact with the outside world, and another 2.2 million hectares in “communal reserves”, protected areas encompassing various communities. Although Bagua put communal land rights on the policy agenda, however, titling has been slow in recent years and only a handful of usufruct contracts have been issued. Meanwhile, promotion of development in the Amazon has persisted, and conflicts continue over the use of resources on community lands. This long and complex history highlights a series of reasons why implementing land and forest tenure reform in Peru has been difficult, Monterroso says. Lack of clarity about procedures and about which government agency is responsible slows the process. That is further complicated by an unclear and expensive procedure for classifying land use based on soil analysis, and the unclear and costly process for obtaining usufruct contracts. Peru still lacks a single map of titles and concessions, so boundary disputes and conflicting claims continue to hamper progress on community titling. Over the past two years, there has been a renewed effort to title indigenous communities in the Amazon, partly because of funding from climate-related programs aimed at preserving forests. That could offer an opportunity for overcoming some of the obstacles, Monterroso says. 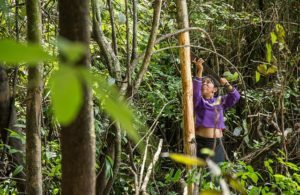 “It’s important that there is a clear road map, so the benefits of land and forest tenure reforms reach the communities they were meant to benefit,” she says. The responsibilities of national and regional government agencies in the titling process must be clear, they need to coordinate among themselves, and they must have the necessary staff and budget funds, she says. Indigenous communities also need allies in those agencies who can help them navigate the system. Tenure reform can also be linked to sustainable resource management in communities. 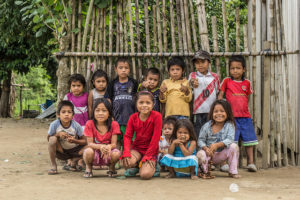 Indigenous groups in Peru have proposed an “indigenous REDD+” scheme, which uses climate-related funding to promote titling and livelihood plans. By Barbara Fraser, originally published at CIFOR’s Forests News. For more information on this topic, please contact Iliana Monterroso at [email protected] or Anne Larson at [email protected]. This research was supported by the European Commission, Global Environment Fund, International Fund for Agricultural Development, and Food and Agriculture Organization (FAO).